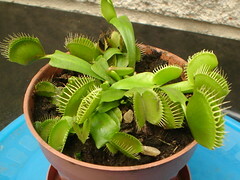 Venus Flytraps require recreation of its natural habitat for it to survive. If removed from its natural environment, certain steps have to be made to ensure successful cultivation. One of the important things that gardeners have to take note of is the fact that these plants have to be repotted at least once in every two years. Leaving it inside the same pot for too long is not healthy for the plant. Eventually, it will lose its vigor and strength. In fact, these plants have the tendency to bury itself into the ground each year. If left on the same situation for a long time, the plant may eventually die. The compost of the pot also becomes sour as the years go by. Salt starts to accumulate, which will eventually stunt the plant if left unattended. The first thing to do when it comes to repotting is to simply take the plant out of the pot. Observing the root system once the plant is removed helps assess the status of the plant’s health. A white tip is a sign of a healthy root system. The next thing to do is to remove the compost around the plant. Some traps may be removed during this process but that is only natural. In fact, it is very difficult to remove the compost without including some traps as well. This does not harm the plant. Removing the compost will reveal the separate bulbs hidden underneath the soil. Flytraps divide as it grows in time. The division can be simply pulled apart by getting rid of the compost in between these divisions. It is also best to remove old leaves and dead roots from the healthy bulb to avoid molds and other fungal problems in the long run. Classify the divisions based on the size of the bulb since this will influence the size of the pot that they should be placed in. 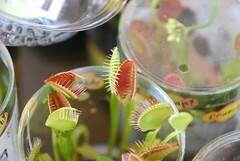 When it comes to taking care of Venus Flytraps, it is important to keep in mind that they do not like to be over-potted. This means a small plant should not be placed in a large pot. When repotting a Venus Fly Trap, take a hold of the bulb and bring the leaves together. Allow the roots to hang down to the bottom of the pot. Place the prepared compost around the plant, which should be at the center of the pot. Remember not to press the compost in but give it a good shake to fall on the roots instead. Once this is done, place the pot on the water tray to allow absorption. Awesome video! Another cool plant to grow is the pet TickleMe Plant. The TickleMe Plant won’t hurt a fly but it will close its leaves and lower its branches when you Tickle It! See video..its worth sharing and growing.